Johnston Community College, Johnston County Economic Development, and other community partners celebrated 10 years of success at the Johnston County Workforce Development Center during a luncheon on Tuesday. College, county, and industrial leaders gathered to recognize the collaborative effort which created the 30,000-square foot education and training center in 2005. The purpose of the Workforce Development Center is to create an education and training center to support local industries by offering learning opportunities from elementary through post-secondary in science and biotech, and other areas of economic influence within the county. 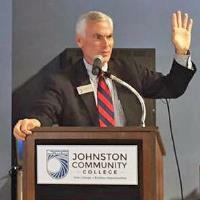 JCC President David Johnson said the center, which is operated by the College, is a shining example of the role JCC plays in economic development. "Let's continue to dream big and be ready," Johnson said. County commissioner chairman Tony Braswell thanked those responsible for the vision of the Johnston County Workforce Development Center and the collaboration of the community, education, and industrial partners who have made the center a success. "We've got a great county, great community college and school system all working together toward the betterment of our county," Braswell said. "It's only fitting we come back to this facility one week after the Novo Nordisk announcement. It's a great time to be in Johnston County." Currently, the College offers three degree programs at the center - associate in applied science in bioprocess technology, associate in science in biology and biology education, and associate in applied science in pharmacy technology. The BioWork curriculum and other skills training programs are also offered at the Workforce Development Center along with small business seminars and customized corporate and industry courses. Since 2005, the center has served 89,000 people in curriculum and continuing education classes, small business center workshops and customized training.